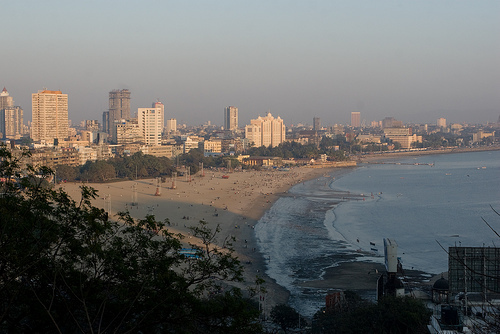 India is a country with a number of large cities, like Mumbai, that would be severely impacted by climate change. Photo by Owen. India has embarked on a new path for tackling carbon reduction in the transportation sector two weeks before the 16th Conference of Parties (COP) event of the United Nations Climate Change Conference held in Cancun, Mexico from November 29 to December 10. The German International Climate Initiative (ICI) and United Nations Environment Programme (UNEP) announced funding for a three-year project, totaling 2.49 million Euros, to support the Government of India in aligning transport growth with the country’s climate change agenda and national development plan. The goal is to develop a national action plan for low-carbon transport and the design of low-carbon mobility plans for four major cities across India. a “road map” for the development of a sustainable transport system. and climate change adaptation measures. The UNEP and ICI project is also endorsed by the Ministry of Environment and Forests and will be carried out in conjunction with the Ministry of Urban Development in India. ICI is an international mechanism for financing climate protection projects related to climate change mitigation, adaptation, biodiversity and capacity building and policy advice. The organization receives funding from the sale of tradeable emission certificates. Local partners include the Indian Institute of Management, the Centre of Environmental Planning and Technology University in Ahmedabad (the technical leader of the development of Ahmedabad’s Janmarg bus rapid transit system) and the Indian Institute of Technology in Delhi. India’s transport sector is responsible for 12.9 percent of the country’s greenhouse gas emissions. The UNEP press release notes that population growth coupled with “rapid increase of private vehicles and a switch from rail to road transport across the freight and passenger sector” are causing India’s per capita carbon emissions to rise steadily upward. The India government has a plan called the National Action Plan on Climate Change (NAPCC), released in 2008, detailing India’s policies and programs for climate change mitigation and adaptation. The policy has specific goals for increasing India’s use of renewable energy, increasing energy efficiency in India’s industries, promoting urban planning and transit plans that reduce emissions, and improving water efficiency, agricultural methods, forest cover and biodiversity.